The Istanbul 1000 Km (4 Hours) wasn’t 17 year old Ed Morris’s international debut: that came at Silverstone last August, albeit briefly, in a Tampolli. 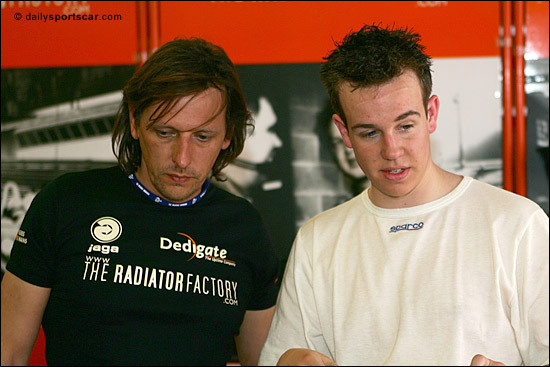 He also raced in the latter half of last year, overseas, in the Sports Car Challenge in a 3.5 litre Jade Trackstar, after abandoning the Ginetta G20 series – and although that gave him some sportscar experience, it was just a stage in the programme, to build experience – before a maiiden, overseas Le Mans Series race, one in which E. Morris would find himself in Frank Hahn's G-Force Courage Judd for five-eighths of the race. Team owner Frank Hahn needed convincing – of course he did: he wasn’t about to let a 17 year old out in his pride and joy without proof that he was up to it. That came at a bitterly cold and snowy Zolder last November, where Ed lapped sensibly and consistently over 13 laps. 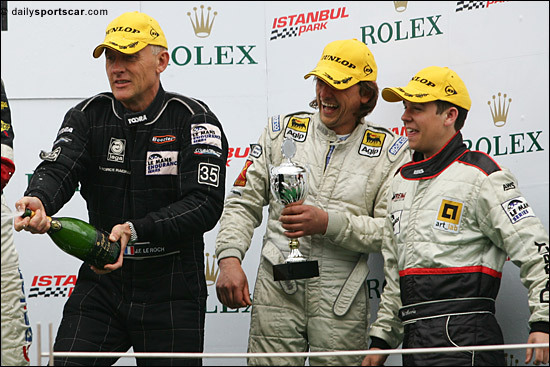 Frank was convinced, and with the support of his family, Ed Morris was ‘in’ – for the 2006 Le Mans Series and Le Mans. The rest of us can only imagine the sense of anticipation that must have been building up within this young man during the last few months. The Paul Ricard test added just a further 25 laps to his experience, although (surprising) engine trouble cut that test short. Next stop Istanbul... with some frantic work from the team to be ready (on another continent) in time. Walk the track on Thursday – then, in theory, have the car to yourself for most of the one hour session on Friday. Except that the Courage stopped on track with an electrical glitch, and Ed Morris was seen walking in at the end of the session. 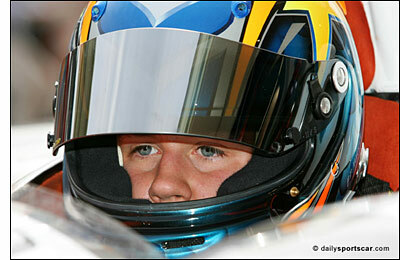 “He got only seven laps in, and his times were coming down at a second or two each lap,” said dad. 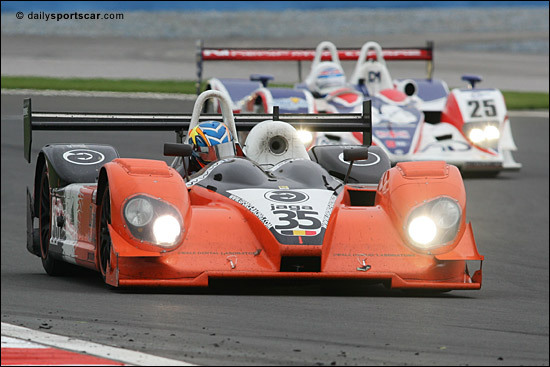 That meant fifth fastest – with Martin Short making the LMP2 news that day, in the Rollcentre Radical. Saturday included two one-hour sessions before qualifying, and Jean-Francois Leroch (at the wheel, below) and Frank Hahn had the first hour, with Ed down to occupy the car for the lunchtime session. Leroch was into the 1:47s in the early session, the car’s fastest lap of the weekend, but in the sometimes slippery second one, Ed Morris got his times down into the 1:50s, sixth fastest. He was right behind the similarly-powered Pilbeam. So race day dawned overcast and damp, and Jean-Francois Leroch was down to start. Anything can happen in an endurance race: supposing Leroch had got involved in a start-line skirmish, as the RML entry did? But he didn't, and after an early stop for slicks, Leroch completed the first hour in fourth place – behind Vergers in the Barazi-Epsilon Courage, Andre in Belmondo’s #37 Courage and Rostan in the Pilbeam. Jean-Francois Leroch pitted again after 43 laps, from fifth (82 minutes into the race), having been passed by the recovering Radical. Ed Morris hopped in, still on the same Dunlop slicks, and thanks to the ‘lap by lap’ information at www.lmes.net we can follow his every lap time. How about these five to start with? 1:53.406, 52.813, 51.937, 53.250 and 51.781. Ignoring the fourth lap (traffic) there’s a very neat pattern there. Finding the pace…. nibbling away at lap times. How about laps 59 to 67? And all this with (2005) rubber that was fading, especially the right rear. “They were going off after 10 laps, but it was just a case of looking after them,” said the young man afterwards. He pitted on lap 76, and stayed in the car. Frank Hahn had a cunning plan: with the race now reduced to four hours, Frank had decided not to drive, because there was the possibility of a podium finish…. The first sub 1:50 came on lap 87, the black, white and orange Courage still fifth in class at this point, the #37 Belmondo Courage 90 seconds or so up the road – but Morris was catching the Ford France-backed car… which pitted on lap 88. Every one of Ed Morris’s laps from then up to lap 100 was in the 1:49s and 1:50s – while the Belmondo was stuck in the 1:52s. You can see Frank Hahn’s logic. Since that Belmondo stop, the gap had grown, from Morris 34 seconds ahead to Morris 68 seconds ahead. 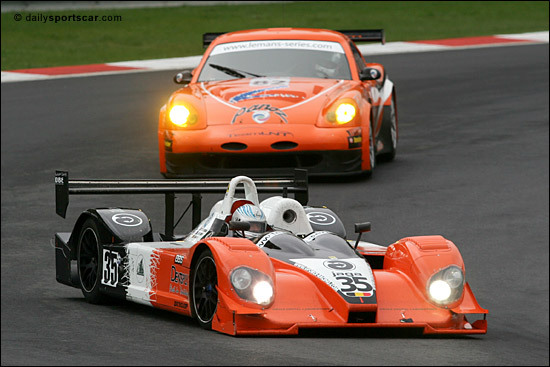 Here he is ahead of the recovering Mike Newton, in the RML MG Lola. “They just refuelled me and sent me out again…,” said Ed. of the #35’s final pit stop, for half a tank of fuel. The youngster later admitted that with only the merest hint of a radio signal, and that was only past the pits, he had little idea where he was in the race, and all he could do was keep up the pace. We reported that he’d seen a Belmondo Courage spin late in the race, but that must have been the other blue Courage – we think. The better placed #37 pitted for its final stop after 112 laps, two laps after the #35 G-Force’s last stop, and now the true gap was 50 seconds. That grew to over 70 at the flag – but the more significant incident in LMP2 was the retirement of the Rollcentre Radical, with just ten minutes to go.. promoting Edward Morris to the podium. 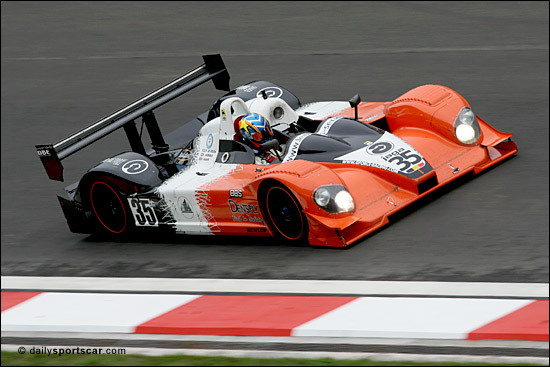 Ed Morris had driven for 158 minutes, and brought Frank Hahn’s Courage home third in LMP2, behind the Barazi-Epsilon C65 and the Pilbeam, the latter making just three stops (four and five for numbers 35 and 37). That referred to the two and a half hours plus at the wheel, not standing on the podium, where he looks as though he's struggling to take it all in. Frank Hahn looks suitably delighted, while Jean-Francois Leroch sprays the bubbly (which Ed is technically too young to drink). Frank Hahn and the whole team were thrilled with their first Le Mans Series podium – and Ed Morris is now a personality in his own right in Belgium. 17 and heading to Le Mans…. although he’ll be just 18 by then.